The installation ’30 fires’ by EMERGE is composed of 30 different fire sounds. Each fire sound has exactly the same duration and was looped 30 times in a row. Most of the sounds change their volume in steps of 0.5 decibels with each repetition. A few of the sounds were randomly placed at -20 decibels, thus interrupting the structure for seconds. Through this, the composition becomes as unpredictable to its listeners as the sounds of a ‘real’ campfire. 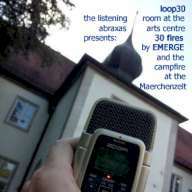 Following the 30-minute composition, they hear an unprocessed field recording of the campfire in the Maerchenzelt (Fairy Tale Tent, a storytellers’ stage in an actual tent) on the grounds of the abraxas Arts Centre, where the sound exhibition took place. The campfire is an essential ingredient of the special atmosphere in the Maerchenzelt.